Science helps students learn so much about the world around us. I really enjoy teaching science, but haven’t yet found a curriculum for my really young students that I love. 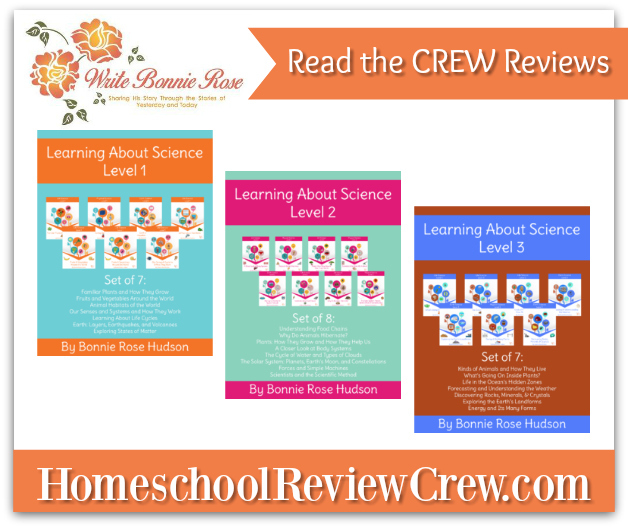 That’s why I was excited to try a new one, Learning About Science Collection, Level 1 from WriteBonnieRose. What Is Learning About Science, Level 1? I received a digital product, containing eight different PDF files. Seven of these are to use with the student, and one is a resource guide for parents that provides resources for teaching the content through a Creationist view point. By working through one file at a time with your student, you’ll provide a great overview of many different types of science. It’s an excellent product to introduce your young learner to science. As you can see, this introduces students to physical science, earth science, and biology. It’s a great foundation on which to build further study. I used this product with my six-year-old. Because she has a fall birthday, she was finishing up kindergarten this year, and will be going into first grade in the fall. I read her the topics to choose from and allowed her to pick where we start. One great thing about this curriculum is that you don’t have to use it in a certain order. You can start with any of the lessons and move through them in any order. My daughter picked Animal Habitats of the World. She loves animals! I printed a couple of pages each day, and read them aloud. As she grows in her reading skills, she’ll be able to read them independently. There’s space for some handwriting practice throughout, and some coloring, so I had her complete those as appropriate. The lessons provided information on both habitats, and animals that live in them. We learned some fun facts! Then to mix things up a bit, we had fun locating places on the world map, looking at pictures of animals online, and drawing pictures of habitats and animals. I really enjoyed using this product with my young learner. The text was informative, but not dry. There was the perfect amount of information in each lesson to keep it from being too overwhelming. The handwriting portion keeps the student engaged, and helps reinforce the concept of what they are learning about. The pictures are cute, but not distracting. They definitely peek interest and provide additional information for students to see. The accompanying PDF that includes resources for teaching these concepts through a Creationist standpoint is very helpful. There are some fun videos and other resources. I’m looking forward to using the remaining books in the level with my first-grader as we move into the upcoming school year. She’s already picked out Fruits and Vegetables of the World to tackle next. This one shares some facts about common produce, including where they grow and other uses for them besides providing nutrition. Another lesson that looks enjoyable is Exploring States of Matter. I like how this one breaks down what can be a difficult concept for young students to understand, and presents it in bite-sized pieces. 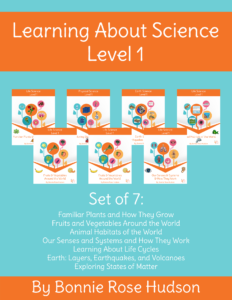 If you have a young learner who is ready for a big picture overview of many different scientific topics, I’d definitely recommend Learning About Science, Level 1. To see what other families thought about this, and other levels of science from WriteBonnieRose, please click on the banner below.